It gave me a glimpse into awful environment that so many people, humanitarians and civilians, live through every day. 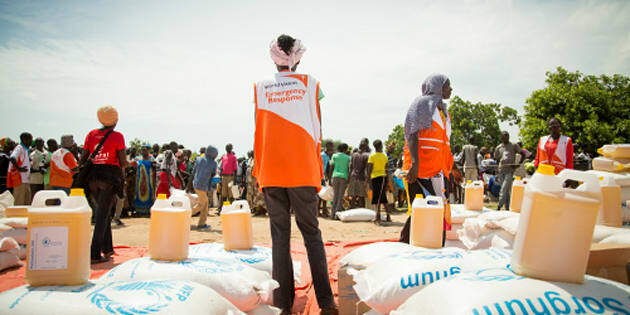 World Vision aid workers supervise food aid at Bidibidi refugee settlement in Uganda. This World Humanitarian Day, as the threats to aid workers increase, their protection has not, which is why more and more humanitarians require military-grade survival training to do their job. We were driving down a bumpy road after having just delivered food commodities at a refugee camp. My colleague and I barely had a moment to find our bearings before we realized we were being ambushed. Shots were fired in every direction while others' fight or flight responses kicked into gear. I simply froze. Amidst all the chaos, I couldn't recall what I was supposed to do when being shot at. Someone was yelling at the driver to put his foot on the gas, but as he slumped over the steering wheel, I realized he was dead. In a matter of moments my body remembered what to do and, ducking low, I jumped out of the car and ran for cover in nearby bushes. Through the smoke I could still hear the shots in quick succession, coupled with the panicked yells of my coworkers dashing for cover. I wasn't safe where I was, but the hiding place allowed me a few seconds to plan my next move. On the left, a photo of me after being "kidnapped." On the right, a photo in my normal existence. In war-torn "Ganton," scenarios like this are common. But, they're also fake. In reality, Ganton is a training camp in northern Washington State where humanitarian workers like myself are confronted with armed attacks, gun battles, mass casualties and even kidnappings in various role-playing scenarios. The point of the exercises is to train our so-called muscle memory so that if an actual scenario plays out in one of the areas we work, our bodies would automatically know how to respond. The chances of that actually happening are minimal. As a media specialist in Canada, I sit behind a computer screen most days, where my biggest safety concern is knowing what to do in a fire drill. However, with occasional travel to hostile places like South Sudan and Somalia, there is still a risk. And no matter how insignificant, it's not a risk World Vision is willing to take without thoroughly preparing staff to be ready for anything, anytime, anywhere. Almost four Canadas' worth of people don't have the ability to fly home to "normal life" like I did. HEAT — Hostile Environment Awareness Training — pushed me to the edge of both my mind and my body. With over 200 people involved in role playing and supporting to bring Ganton to life, there were moments when the trusty assurance at the back of my head, telling me this was all fake, simply failed. Being interrogated during a kidnapping where I was blindfolded and handcuffed was one of those moments. Seeing a child covered in blood (fake) under the wheel of a car was another. When armed men attacked my tent while I slept, I was put on edge for the rest of the training, and a little while after, too. I came back from Ganton in a daze. It felt strange to pack my backpack with a laptop and notepad when all week it was filled with a GPS, tourniquet and granola bars. Going into the office instead of setting up an operations room in the woods seemed totally trivial. And in assessing my own inability to seamlessly switch back to reality, I couldn't imagine what it's like for those who don't have the luxury to turn off the intensity at all. Women like me, in places like Syria, South Sudan, Somalia and just too many other countries to name, manage a balancing act of being mom to their kids while being confronted by very real threats that they're trying to protect their children from — threats that aren't too different from the pretend ones we experienced in training in Ganton. Above: Left to right, four-year-old Judith, two-year-old Gladys and four-year-old Susan fled their homeland in South Sudan and are at Bidibidi refugee camp in Uganda. Children like them are witnessing scenes of horrific violence. Thousands of children have been killed, abducted or sexually assaulted. This shouldn't happen. Children are #NotATarget. One of those women is Josephine, who I met at a refugee settlement in northern Uganda. She fled South Sudan with her five children when rebels attacked their village and burnt down her house. During this time, she was separated from her husband and had to make the difficult decision to come to Uganda without him. She told me that she wasn't sure if he was dead or alive, and worried about him constantly. On top of her own anxiety, she had to remain strong for her children as they looked to her for support. In my world, words like "conflict," "crisis" and "refugee" remain words, but for so many people, that's life. A record 128 million people face conflict, displacement, natural disasters or profound vulnerability. That's almost four Canadas' worth of people that don't have the ability to fly home to "normal life" like I did. #NotATarget is the theme for this year's World Humanitarian Day, because all too often that's exactly what both civilians and humanitarians have become. Mothers, fathers, children or responders trying to make a difference, are no longer protected in conflict situations as they should be. The goal of HEAT training was to prepare me for travel to these types of environments, but it did so much more than that. It gave me a glimpse into awful environment that so many people, humanitarians and civilians, live through every day. And it brought back into focus the reason I chose to work in the humanitarian sector in the first place.